Durable, flexible in working, tried and tested for generations: lead sheet to DIN EN 12588 embodies all the qualities that make lead an outstanding roof and façade material – extreme weather resistance, unique cold forming properties and complete recyclability. 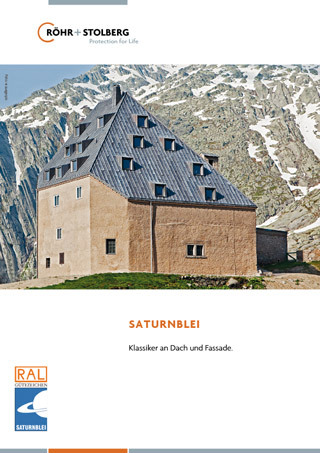 Röhr + Stolberg is the leading supplier of lead sheet to DIN EN 12588 and produces it in line with the strict requirements of the Gütegemeinschaft Saturnblei e.V. Regular checks are carried out to ensure that the alloy composition, dimensions and physical properties meet the highest standards. When left untreated, it develops a characteristic patina under the influence of the weather. This effect is often desirable, as it acquires the authentic look of countless historic buildings – but it can lend modern buildings a striking visual appearance too. If the sheets are patinated following fitting, however, their original metallic appearance is retained. 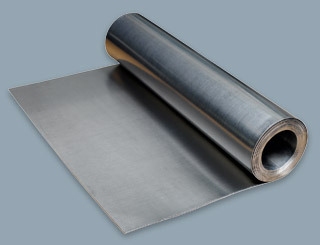 Lead sheet to DIN EN 12588 is suitable for sealing and can also be laid on large surfaces. Röhr + Stolberg supplies patination oil and lead wool as complementary products. Like all lead sheet products from Röhr + Stolberg, lead sheet to DIN EN 12588 is manufactured from recycled lead and is ideal for recovering. Lead sheet to DIN EN 12588 from Röhr + Stolberg is certified with the Environmental Product Declaration of the Institute Construction and Environment e.V. Lead sheet to DIN EN 12588 is handled and worked following the technical regulations of the Gütegemeinschaft Saturnblei e.V. DIN EN 12588 is also available in corrugated form. Other dimensions and flat sheets possible on request. Do you have any questions about our products or our company? Use our contact form and we will contact you shortly.